... but just in case you misinterpret, not the one in the euphemistically named Throne Room aka the commode etc. However, last night the situation deteriorated, and I was not at all comfortable. In the event, this morning I decided to seek a comfortable and back-restful-and supported position and simply relax by reading and/or playing on the DS in order to give the back an opportunity to begin to heal itself. Therefore, I propped pillows under my knees, back and head in bed and prepared to relax. Unfortunately, that didn't do the trick; it simply wasn't all that back-comfortable. Then, I tried the floor with much of the same equipment but with my knees supported by a chair. In the distant past, I sometimes found that to be a helpful and restorative position, but not this time. How about the Easy Chair with similar props and supports? Nyet. I am finding I'm just about as comfortable standing or sitting at the computer — comfortable being a relatively inappropriate and unsatisfactory word in this case, but I'm sure you take my point. In a sense I should be glad that sitting at the computer is as good or better than most most positions, for it affords me the possibility of being productive. Unfortunately, I don't really wish to be productive this morning. No, I wish to be lazy and comfortable. So ... I'm not sure how I will spend the day's many, many remaining hours. One thing that I can do is share the following Nikki-Dee photo with you. Cuppa had been flooding the internet with all sorts of pics and descriptions, but she missed this photo, and it's one that I particularly like. I think of it as The Princess on Her Throne although it is plain to see that she's plotting some sort of mischief and about to depart said throne in order to commit mayhem. If only I could find a comfy throne today, I'd stay there for a while. Really, I would. I'd plot no mayhem at all. However, I'm sure it was a much happier day when we visited at Christmas in 1947 (above) when I was three months old. Since Dad also followed in the greenhouse grower trade, I find the setting of the photo most appropriate. While I didn't inherit the grower gene, there was a time about ten years ago when I became very interested in gardening and planted a fairly nice perennial garden for several years. In my case, it was about learning and doing something and moving on, but these two forebears of mine made it their life's work. The next picture has a sign that shows the location of all of the greenhouse photos in this blog (I think). I believe Royalview Nurseries was located in Ste-Thérèse, Quebec, outside of Montreal. That appears to be my grandfather on the far right, and he would have been about fifty years old at the time. I'm pretty sure the middle guy is the owner, Carl Luck. I remember him visiting our place near Toronto in 1963, a year after we had moved there from Montreal., and offering my Dad a job in Ste-Thérèse. I was pleased at the notion of moving back to the Montreal area, but my parents thought that Ontario was a better location for an English family. Perhaps if the job would have been right in Montreal and not in a mostly French town outside of the city they might have thought differently, but I doubt it, and I am happy with their decision. The next two photos were also at Royalview Nurseries taken when I was two in 1949. I'm disappointed that I couldn't so something better with Grampa's face in the first picture, but it was incredibly dark in the original. I did my best to lighten it, but there was little to work with, and it looks pretty phony. I often heard my father talk about Grampa's horses, particularly Bob in the first photo, 1917, pulling Grampa in a sleigh along a very snowy Montreal road. Bob's claim to fame was his reaction to the noon hour and five o'clock whistles. When the whistle blew, he would turn directly for home wherever he was. I don't recall hearing any stories about Barney, shown in this very poor quality 1921 photo. It shows Grandad in the front middle and my father on the side. I think that's almost all that I have to post about Grampa himself, but I think that I'll share some photos of his birth family in the near future. It was more than three months ago, almost four months (good grief that's a long time!) 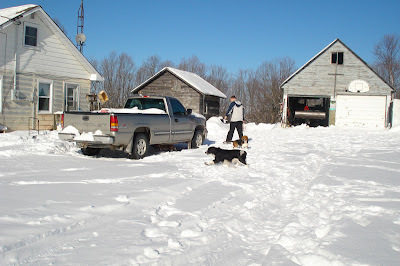 in fact, when I posted two blogs about my paternal grandfather: On the Estate with Grampa and Some Memories of Grampa. 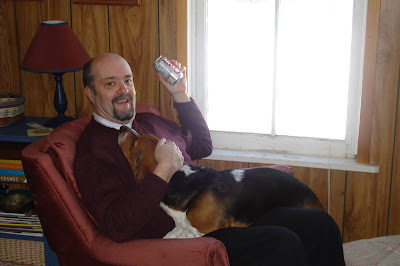 At the time, I had meant to post an additional blog with the following photo and a few tidbits of information from the photo album, but life and other topics karoomed into Grampa's ancient path. But I'm sure he is/was okay with waiting; he's very patient these days, you see. A note on the back of the photo says that grampa worked in the greenhouses on this estate which also employed 52 other servants. I am guessing that this was his start as a greenhouse grower, and he pretty well stuck with occupation, or it stuck with him, for most of the rest of his days. The photo is professionally done and in a cardboard frame that says J.S. Platt, The 'Primus' Studio, Warlingham on the front. According to Google Maps, a place called Warlingham lies to the south of London, but I can't be sure that it is the same Warlingham (whether the estate is in the same general location as the village or town of the same name), and Grampa seems to be unavailable for comment unless someone out there in cyberland has some expertise in communicating with the dearly departed. I am able repeat two tidbits from oral history about Grampa's early years, one of them pertaining to this estate. Tidbit One: it has been recounted that when he had decided to emigrate to Canada, his Warlingham employer though so highly of Grampa that he said that if was a matter of money, that he would increase Grampa's wages. Apparently, it was not a matter of money. Tidbit Two: it is recorded in the photo album that Grampa set out or perhaps was sent out to earn a living when he was eleven years old. Although I seem to recall being told that he worked and boarded in a department store early on, the only written note declares that he first became an apprentice carpenter. Whether he held other jobs between carpentry and being a grower at Warlingham, I know not. I also don't know how it came about that he moved from the Cambridge area, about 80km north of London to Warlingham, about 20km south of London. It seems like a rather big move for the times, but I guess it pales in comparison with his later trans-oceanic journey to Canada. Born April 11 1878, I can't be sure of the year of his migration to Canada at this time, but I can say that he seems to have held some sort of job in the forest industry in Quebec's Eastern Townships for at least one season. Also, although I may be repeating myself from a previous blog, my Dad often said that Grampa didn't even need to wear a heavy overcoat in his first Canadian winter. I've never quite understood why that might be so, but apparently it is sooth. Also, from what I can gather, he never expended much energy in communicating with the folk that he left behind in The Old Country. As one of many children (sixteen, I think) who had go to work at such a tender age, it was told to me that he was pretty disgusted with people having so many kids that they couldn't properly take care of. But his sister, also later also migrated to Canada, and she may be responsible for most of the information that I do have through various pictures and notes in my mother's photo album. What I can repeat is the information that he remained as a grower/flower designer for most of his life. He seems to have had an entrepreneurial bent, a trait that, apparently, hasn't been passed down. He owned his own greenhouse business in the Snowdon area of Montreal (see next photo). I would guess that he owned this place in at least some of the first half on the forties, perhaps beginning sometime in the thirties. My mother placed a note beside the photo, drawing one's attention to his topiary work outside the shop: chicken to left and basket to right. He also bought a car/truck fairly early on. My dad often recounted how Grampa's Ford cost $600 and that Grampa was able to purchase it with cash. I have two photos, below, of vehicles although I am somewhat confused by the dates. The first photo with Grampa in the middle is captioned as Grampa's First Truck, 1935 but the second shows my father standing on the running board of another Ford truck in 1923. It's time to cease this post, but I think there's still more to post at a later date. For whatever reason, my back is spasming today, so I'm lying low — so to speak. It started last weekend, but didn't get too bad, as far as back attacks go, until last night. In fact, up until then I had thought this one was quite tolerable — relatively benign as it were. But it kept getting a bit worse as the week progressed, and now it isn't good at all. I don't know why it has to get really bad before it can get better, but that seems to be the way of it. It's a sore trial (so to speak) to get up and down, and when I'm up I must move gingerly. When the back is bad, the very worst thing is putting on socks. But I must because it's winter, and my feet are silly enough that I tend to require them even on the hottest day of summer. Yes, I agree, I'm a strange duck. There's not much to do. I could read, but since I am fairly comfortable in my computer chair, I've decided to do some Tenth Month Nikki-Dee pictures. Perhaps, I could be accused of narcissism by featuring just her and me in this collage, but I don't think so. I just saw a bunch of photos of the two of us that I rather liked and thought I might as well make a collage with a theme. I'll totally leave myself out of the next collage. Promise. Now, could somebody please help me with the socks?! I have mentioned receiving a Nintendo DS Lite for Christmas. When Powerpuff was here last autumn, I was impressed with hers, so much so that the family bought me my very own for Christmas. The amazing little device can perform both rudimentary voice and character recognition, and I think that's pretty impressive. On most days, I will play a game of Sudoku on the DS, and I find that I much prefer playing the game on the machine rather than on paper. Paper is messy, especially when I get to scratching out notations or changing my mind about an answer, but the DS makes it easy to erase neatly and keep myself well organized. And the box will tell me if I've made an error in real time, so I don't have to plod through the whole puzzle in order to find out that I've made a wrong turn. Mind you, the penalties are high for such a warning, for the DS assigns me a 20 minutes time penalty per incident. Sometimes, that's enough to more than double my time. I have posted previously that careless errors are a bane, and that trend continues. Although I do find that I can now generally force myself to make fewer errors per game and sometimes none, there are still times when I say one thing in my head but enter the very opposite. Why that is, I'm not entirely certain, except to say that I am very poor at checking and proofing. Once I have something in my head, I tend to plunge ahead without further critical examination. Although there exists a plethora of DS games, the only one that I personally play on the DS is Brain Age. In addition to Sudoku, there are training programs in Brain Age that are designed to stimulate one's prefrontal cortex and keep one's brain young — or perhaps less old. It can test the age of one's brain through three random tasks per test and then score the results by telling you that your brain is 24, 42 or whatever. Currently, it informs me that my brain 37 years old. I have been scored lower (33 I think it was), but I confess to usually being pegged somewhere in my forties. While that's better than my actual age of 60, I don't fool myself into believing that my brain is 20 years younger than its true chronological age. 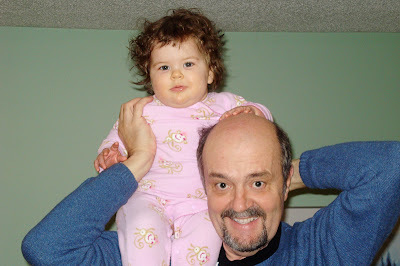 No, that thing inside my noggin simply doesn't work as well as it did 20 years ago. When I see younger people playing with Brain Age, I can't help but notice that they are quicker, especially when it comes to memory. One of the tests supplies us with a list of thirty random words, gives us two minutes to memorize them, and three minutes to list as many as we can. The best that I have done is 14 out of 30, but Thesha can easily recall more than 20. I also struggle with the other memory-type test when the DS flashes, and I do mean flashes, numbers in boxes in random order. I then must remember the order of boxes from lowest to highest. While I can usually remember sequences of four or five, I have trouble with six and anything beyond that is pretty well a toss. The very easiest test for me is the syllable count. It's so easy for me that I can barely fathom why it's in the game at all or that it could not be easy for eveyone. It presents the player with some random phrase such as, A Bird in the hand is worth two in the bush, and the player must say 11. If s/he doesn't get it right, the DS will simply wait and wait until one does figure out the correct response. It scores on speed, and mine must be pretty fast in the this particular task because it scores me highly. It's very simple for me, and I assume that it must be so for everyone, but perhaps it isn't. But I'm not terribly fast on any other test. I do well enough on arithmetic in terms of getting the correct answer, but DS doesn't ever rate me as being scorchingly speedy. Even when I feel like I'm going lickety-split, the DS disagrees and pegs me in the medium range. So, it's memory and speed that slow down as we age, or at least that's the case for me. While I can still process logically, it simply takes a little longer than it does for the kids. It's new stuff that sinks in ever so slowly. My violin teacher notices it. As we discussed certain concepts during my last lesson, she mentioned that when she teaches something new to the kids, they tend to get it right away while the adults tend to stare blankly. And I have seen a similar thing with the daughters. When the A Team was visiting at Christmas, I could see how quickly their brains would fire when playing Cranium, for example. It was almost scary to see them flying ahead with a million possible answers while I was still trying to process exactly what was being demanded of me, never mind trying to think through to the elusive answer. Frankly, it was discouraging and frustrating at times. On the other hand, we played also Cranium with our similarly aged in-laws just recently, and we all seemed to process at about the same pace, and that comforted me somehow. I'd be interested to hear what changes you notice as you age. Even if you are still much younger than I, you may already perceive some shifts. How do you feel about these changes: depressed, anxious, calm, indifferent, resigned? Below: a typical night might very well see me wrapped in my blanket and playing Sudoku on my DS after I have tucked Cuppa in and read to her. If the stars align correctly, after playing I might turn out the light and curl up right there in my chair and drift off to sleep. 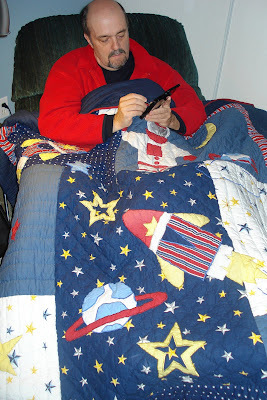 Both the blanket and the Nintendo were Christmas presents, the blanket being picked out by Althegal. As you can see, it's quite unique, as is she. I think of her almost every time I see it or use it. 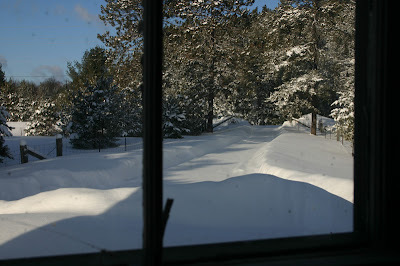 Just a week ago this morning, I took this photo through the cottage window. Minutes later an otter came gallumphing down the lane. Well, I at first thought it was an otter or seal because the gait of whatever it was seemed like the way those critters move on land. 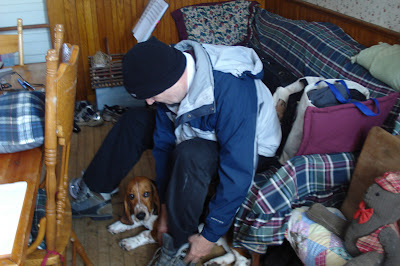 But it was a doggie: a Bassett hound with very short legs that made it difficult to go through the snow. Isn't he cute? He wasn't just cute but nice. A real cuddler. But he was lost and without even a tag. So I donned my gear and set out to see if he belonged to the neighbours. It's country up there, so neighbours aren't all that close, and I had to drive. I could distinguish dog tracks in the nearest neighbour's place, but they weren't home and the unshovelled snow informed me that they hadn't been home for some time, so I drove on to the next house, and it didn't belong to them either, but they sent me to its possible owner. Except it wasn't. It was, however, a local lady with deep roots in the area, so she began to call around. Meanwhile I called on several other locals, but no one knew the doggie, and animal control had no reports of a missing dog in our area. What to do? We were going home the next day, and we're not able to take in a stray dog at this time, especially one who would have to be transported a long way in a very packed vehicle. Well, the local lady was willing to take him in as she searched for his owner whom she thought she would be able to track down. 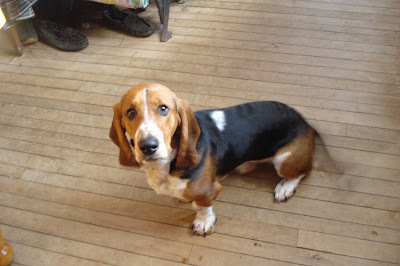 She already had three dogs, one a younger Bassett as it happens, so it wasn't a big deal for her to keep the one extra pooch for a little while. Except, she couldn't track anyone down. Some folks claimed that they had seen the dog wandering down the road that morning, but nobody knows its origin, and nobody was exactly jumping up to claim Barney (our name for the little guy). I hope that he hadn't just been dumped and abandoned by some city person. I know that happens in the country sometimes, but surely not in the middle of winter to an almost legless dog?! It makes me sad to even contemplate that possibility. Anyway, we dropped him off at Nice Local Lady's place and had reason to drop by again later that afternoon. He greeted me happily (see photo below) and Nice Lady reported that he was settling in fine and having a grand time with the other dogs. She said that if Barney didn't have a home, he now had one with her. I hope Barney has a happy life whatever the outcome because he was a very nice, lovable little thing. There he is (above) at her place by my feet as I approached the house on my return visit. These are days of sudden changes in the little life of Niki-Dee, which is the name that I am adopting at least temporarily. She's not exactly a Smudge anymore; in fact, she's pretty large and robust ... as far as babies go anyway. Two weeks ago she was not yet crawling. Suddenly she was. Not only that, but she is stepping out as long as someone is holding her hands. She's most chuffed with herself when she takes those wobbly steps too and tends to chuckle in delightedness with herself. 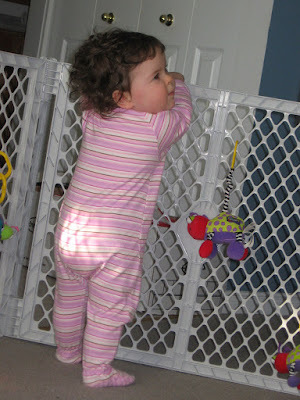 Development number three is that she is beginning to pull herself up to a standing position. What changes in such a short time! And she's happy enough behind the fence. Really. Can't you tell? Well, she is smiling (sort of) in the top picture. I think these will be my last two photos of last weeks trip to the cottage. Both versions are the same basic time exposure from the back porch of the cottage, and in both cases, in order to give it more life, I doctored the photo somewhat with an artistic filter or two. I also cropped the bottom version and applied something known as The Orton Effect, which basically uses blurring to hopefully give it a dreamlike quality. The technique probably wasn't terribly well suited for this photo, but one experiments and sometimes learns. We have more photos for you again today but not pretty postcard types this time. Not at all, just our cruddy old driveway on a mild day — yesterday. 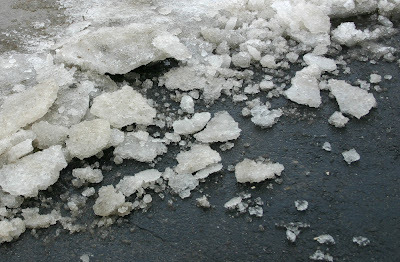 I grabbed the opportunity that the break in the weather provided to scrape ice off the driveway. For the most part, I could get under it with a steel shovel. 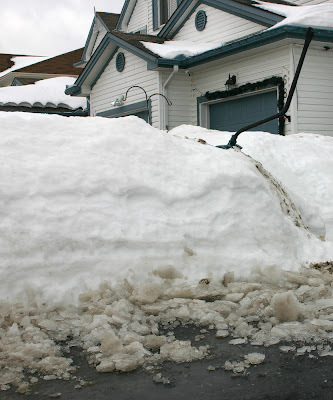 Then, I would throw it onto the pile with the scooper shovel that is planted in the snowbank in the photo below. And I remembered something. I remembered being a little boy in Montreal and my grampa doing the same thing. In my memory the ice was thicker and he broke it up with a pick axe. There were a few spots where I could have also used a pick yesterday too, but alas I am not so equipped. I had always assumed that particular day about 55 years ago was later in the year but perhaps it was in some sort of mid-winter thaw such as the one yesterday. Now I am the grampa chipping up the ice. Perhaps I might do this again with The Smudge in another year or three when she is older, just as I watched my grampa more than half century past. While she watches, I can tell her of my memory of my grampa ... and maybe she will remember me too when she is old, and I am but a distant and fading image in her mind. I wonder if she'll wish in that far off day that the adult her could have a little chat with me just as I wish the adult me could sit down over coffee with my grandparents. Wouldn't that be grand (so to speak)? I promised you more pictures, so whether you like it or not, here they are. This is a bridge to nowhere. The property backs onto the Crowe River, and there is a large tract of forested land on the other side. Some of my BIL's hunt-loving neighbours built this bridge in order to access said land during the appropriate season, but the owner barred the way, so it remains as a Bridge to Nowhere. While I don't love the notion of hunting, I also don't care for the landowner's selfishness. I have seen this more than enough up there where there is an abundance of almost unused land. We're a strange lot, we humans. Another snowy pine branch and cone very near the other in the previous post. The previous two photos showed how sunny it was, but then, as I mentioned in the prior post, the wind whipped up the snow in some sort of devilish fury. It was sudden and strange and only lasted for a few minutes. And this was was of those moments. That's Cuppa and BIL trudging through the driving snow. BIL's two dogs accompanied us, and they are both in the photo, but you might only see one in the size that I am showing you here. So, you see, all of ye doubters, each season has its beauty and charm. Having made that point, I hasten to confess that I've just about enjoyed my quotient of winter charm for this year. It wasn't a typical winter retreat for us — a lot of visiting and appointments and little snowshoeing and picture taking — but I do have a few photos to post in the next few days. First, let me say that the Internet was horrible, but I did manage to sort of keep up with you through Google Reader. I read from there and stayed away from clicking on individual blogs. The first shot (below) was taken by Cuppa on the drive in last Saturday, but I'll claim the photo anyway since I specifically requested that she take this shot. I really like it: the snow, the old truck, the winding road, the dim lighting. Next day, we did go for a snowshoe walk. The sun was bright, and I took this shot of the fence shadows in the snow. Unfortunately, I overexposed, so it's not as good as it could have been. As we snowshoed along the old logging road, I stopped to take a few pictures. In this one, a snowy pine cone overhang the path. Suddenly, clouds covered the bright sun, the wind actually began to howl, and the snow kicked up. I quickly snapped this one and rather like it too. Now that we've had our winter vacation, I'll begin to wish for spring. I know it's too early, and I try no to wish too hard until March, and even then it's too early. Oh well. See you soon with more photos. Cuppa will post another clip on her blog. We're heading out for a few days. We'll be back in the land of v e r y s l o w internet access. By slow, I don't simply mean dialup, but the s l o w e s t dialup imaginable. We'll see if either us get much blog posting or blog reading done. Sometimes, it works out better than others, we shall see what we shall see. I am extraordinarily pleased to report that AC slept like a normal person last night and woke up to a fine, snowy morning. Hey, it's pretty, and since it is still early February and not late March, I can dig it. Get it? Dig? Last night I had a phone conversation with is soon-to-be daughter-in-law. She is a Jew and not totally aware of all of our Christian traditions. One that she loves and has enthusiastically adopted is Christmas. However, while she's obviously heard about Easter, she had no knowledge of Shrove Tuesday and Lent. So I told her about the pancakes and a bit of the tradition and how it precedes Lent and went on to explain (briefly) how it is forty days in duration and leads up to Easter. I explained that historically, one fasts (partially at least) during this period. She: You fast for forty days? AC: Ummm .... no we just eat the pancakes. ... when I wrote It's Not Easy Being Me earlier today, I neglected to mention a main point that I had wanted to raise, which is a problem that I sometimes have: getting carried away with thoughts that I forget my original intent — at least in part. The new thought that has struck me is that some of my nighttime excursions into the realm of sleeplessness may be related to the napping that I referred to in the post below. I think what may happen when I go to bed for the night, sometimes at least, is that I doze off (as in a brief nap) for a certain length of time be it five, ten or twenty minutes. But on some occasions I do not fall deeply asleep and come to after the doze. And that doze might have the same effect as a nap — just enough to re-set my sail, so to speak. I don't know; it's just a new theory, but it sounds plausible to me. I am thinking that I might doze lightly fairly often before falling more deeply into the arms of Morpheus, but every now and then, I experience sufficient rest to become quite wakeful if I happen to roll over and come to. Well, as I said, it's a theory. Perhaps it will help me to become less frustrated to know that I've had some sleep, and I might feel more inclined to turn my head and hand to some sort of productive task. Cuppa reminded me of this picture this morning after I revealed my latest nocturnal escapades and told me that I should press it into service again. I posted it about as year and a half ago in Dreams of Yesterday after yet another bad night, which in that instance was largely caused by some sort of miserable little virus. Yesterday, I was whinging about being tired after a near sleepless night on Sunday and wondering how I would fare at linedancing last night. So, I did something that I hardly ever do: had a wee kip before I went out. I pretty well knew that would revive me for the evening. About once a month or three (seldom in other words), I do this: nap during the day. Even at that level of infrequency, it's never for long, but anywhere from ten minutes to a half hour is generally sufficient to revive me enough to function — more or less anyway. So it was that I lay down for a half hour yesterday and would judge that I dozed for perhaps twenty minutes. I'm sure you would agree that isn't a whole lot and shouldn't throw me off my sleep seven hours later. But it did! Or something did. At one o'clock although I was lying in bed, I was still rather perky and knowing what that could presage, I took a sleeping pill. It kicked in about an hour later, giving me about seven hours of decent sleep. Which is enough most of the time. I prefer not to use the pill although it really helps by times. When I do choose to pill myself, however, I tend to plan it out and take it earlier because it does seem to take the best part of an hour for it to kick in. But my point is, yes there is a point to be made somewhere in this piece, is that when I am tired due to genuine lack of sleep, a twenty minute nap should not wire me up seven and eight hours later. But wait, there's more. What the pill also sometimes allows is for me to sleep more deeply and get up to visit the loo less frequently. On a typical night, I might get up four times or about every two hours on average. Last night I made it through four and a half hours before getting up — almost like a normal person. I think I'm caught in a vicious circle. Bladder realities cause to awake and go more frequently than most but it also seems to me that I feel such frequent need because I am sleeping lightly. So, do you agree that the picture is appropriate: that it isn't easy being me? Yes, it's the day after the day after a night of little sleep. For no apparent reason such as worry or stimulus, I had one of those nights for which I am so famous on Sunday. It just happens every few weeks or so. I gave up my efforts at 2:30 AM and switched on the telly. I seldom do that but couldn't figure out how else to pass the time that night. Thought I: the telly will put me to sleep. Alas! is was not to be. I watched George Stroumboulopoulos on The Hour from 2:30 to 3:30 followed by Peter Mansbridge (with scientist Bob McDonald) until 4:00. Then, I went back to bed, not that I was terribly sleepy, but I have noticed in the past that my mind and body often seem to calm down around that time. However, I was still pretty restless for the best part of another hour. I had a few good hours of sleep then and tried to stay in bed until 9:00 AM, but the last hour was almost fruitless as Cuppa stirred and rose and light poured through the window. Last night I had a normal night's sleep but nothing extra. Now, it's the day after the day after the night before, and I am feeling the after-effects. Don't you find that it's often two days later when you feel the most exhausted? I don't think I'll accomplish much today and wonder if I'll be able to remember any steps at linedancing tonight. Meanwhile, I hope you all enjoy Pancake Tuesday/Shrove Tuesday/Fat Tuesday/Mardi Gras (are there any other names?). Personally, I'm a Shrove sorta guy although I hardly claim to be either Lentish or shriven, I'm afraid. We'll have Thesha and Smudge over, but Smudge will have to be content with the usual mush, I'm afraid. Of course, posting the previous photo of The Bonnie Wee Smudge on my shoulder reminded me of these two when I was twenty-six and Thesha was one. So, she was only a few months older that Smudge is now. Can you see the exhilaration on her face and the delight in mine? What fun we had together. While I maintain that the best time of your life is always now, if any time could change my mind, it was then when the kids were young and brought so much joy into my heart. Ah, the old guy is getting wistful and a wee bit maudlin. But that's what old guys do. Hmmm ... I seem to be flooding this blog with Smudge pics lately. So what's another between friends? She's doesn't seem to be totally secure and happy up there on my shoulder, but I think she's trying to like it. I remember carrying her mother around like this. She loved it, but I may be recalling times when she was a bit older. Her mother always liked being tossed and bounced about, but as we discovered with Thesha's sister, Althegal, not all babies are quite so keen. I don't quite know how to describe grandparental love, not even almost ten months into the role. It's not exactly the same as parental love. I'm one step removed, which is how it should be, but I experience a warm pleasure at what I watch unfold. Perhaps, I actually feel more sheer delight in both observing and partaking. The storm is over, and we're digging out this morning. I don't know how early Good Neighbour got out to attend her good deeds, but it must have been hours before I stuck my head out the door. I'm sure she cleared many driveways before she got to ours, ours being the end of her circle of goodwill. While I shovelled the walkway to the front door, she blew out my drive. I should say our drive, for we share a driveway with the neighbour in the white jacket. There were all sorts of us out there this monring, the guy you see across the street and many others, including the Un-Selfless Neighbour with the tractor and plow. He still just takes care of his own self and nobody else. I had prepared a picture of him on his tractor, but I couldn't find my saved version and figured that The Universe was telling me to go easy in my judgements, so I'll back off a bit. However, such apparent unselflessness tends to anger me, and I was trying to figure out why because it has no bearing on my life or shouldn't. Maybe it's because I expect more of a guy in my age cohort who's lived long enough or should have lived long enough to learn a bit about life and develop some sense of otherness. While I don't know the guy and can't judge about the rest of his life, I am highly suspicious that it is more of the same, and I see it as a sad waste. I think that's what makes me angry, the notion of wastedness. But I'll leave that and not mention it again because it's fruitless speculation that benefits no one. 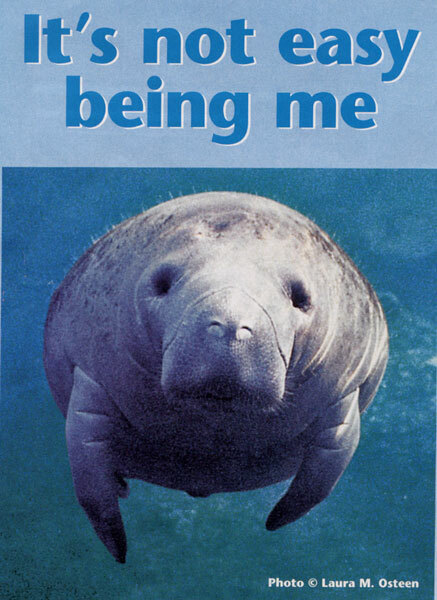 However, I will leave you with this picture. Do you know what it is? I'll tell you below. 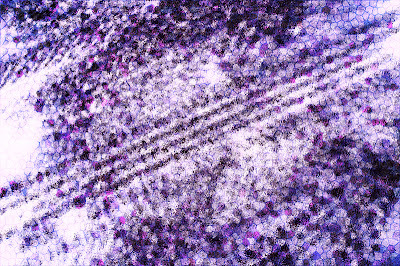 It's simply a photo of snow and tire tracks on the road, run through a few filters. what can I say? It was something to play around with. I think I'll have to postpone my first artistic photos exhibition for ... indefinitely. It's been a stormy day and night here in Ottawa. 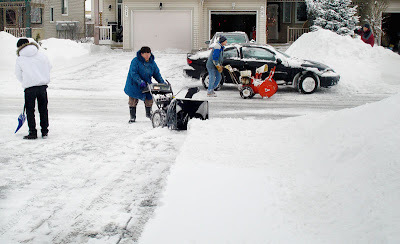 I've been out shovelling once and Good Neighbour has also been by with her snowblower. But it's still snowing, and then it could rain, and won't that be an utter mess? But maybe it will just snow here. Let's hope. This was to be our final day of babysitting while Thesha helped out at work, but the weather forced her to cancel, and we all stayed inside in our respective domiciles. I am waiting to hear whether fiddle practice will be canceled tomorrow, but unless there is a great change by then, I won't venture on a 45 minute drive into the country even if they don't cancel. In my previous post, I bemoaned the fact that I was way behind in my blog printing. While I am technically still way behind in printing, I have imported all of the blogs that I want into Word, and they are ready to print. Hence the title, Done and Done. However, I don't want to start the actual printing process yet because I will likely run out of ink partway through, and I don't have a refill lying around. It took awhile to catch up on more than two years of posts, but I don't choose to print all of my blogs, so I was able to eliminate quite a few. Once they're in Word a few macros and styles help me to do the formatting without too much trouble. So, what else does one do on a snowy day? Cuppa and I did catch up on a few tv programs that we had I taped. I know we don't tape anymore, but you all know what I mean, and I like the word. The main program that we watched was a two hour episode (really two one hour episodes) of Silent Witness (yet another British mystery series). We also tried to get into Waking the Dead, another favourite, but we get that from PBS Boston on Saturday night, and the times always get weirded out. We miss ten minutes every time, and sometimes it's too much bother to try to fill in the gaps. They're re-runs for us anyway, but most are so good, that we wouldn't mind watching them again. There's another PBS program that we tape on the same night, however, Vicar of Dibly, which is a very funny program indeed. I recommend it. Rather than trying to describe it, refer to the BBC website if you're interested. If we're housebound again tomorrow, perhaps I'll read more of Pillars of the Earth. I could be reading it now, but it tends to grab me, and I don't want to be grabbed when it's almost time for bed. I've done that too often: checked the clock at midnight or later, and said, "Well, I only have a hundred more pages to go, so ..." Except I have a lot more than a hundred pages remaining in this one, so I truly don't want to go there tonight. Cuppa crashed early tonight, so I have been puttering and putering, and I'm not sure what to do next, but I don't think I'm quite ready for bed yet. Meanwhile, I've run out of chat for now. I don't do this type of aimless blogging too often, so I trust you'll forgive me. Maybe I'll actually have something to say next time. who knows?